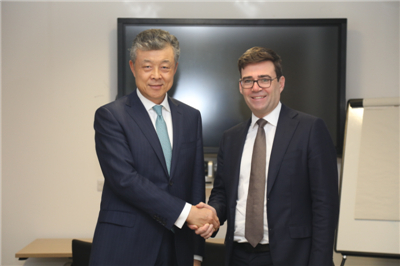 On December 18, Ambassador Liu Xiaoming and Madam Hu Pinghua met with Andy Burnham, Mayor of Greater Manchester, during their visit to Manchester. Zheng Xiyuan, Chinese Consul General in Manchester, John Holden, Assistant Director of Strategy & Research at Greater Manchester Combined Authority, and Rhys Whalley, Executive Director of Manchester China Forum, were present. Mayor Burnham expressed his warm welcome to Ambassador Liu and Madam Hu, saying that he was deeply impressed by China’s rapid development and the strategy of coordinated regional development during his trip to Tianjin and Shenzhen for the Summer Davos in September this year. Manchester is the cradle of the Industrial Revolution. In recent years, it has continuously adjusted its economic structure, promoted its revitalization and development, and has become a financial and commercial center in Northern England. The Greater Manchester has maintained good cooperation with China. President Xi Jinping's successful visit to Manchester in 2015 was a strong driving force for cooperation in various fields for both sides. The launch of direct flight between Beijing and Manchester in 2016 had been hugely beneficial to the Greater Manchester. Attaching great importance to developing relations with China, the Greater Manchester is willing to actively participate in the cooperation on Belt and Road Initiative, strengthen connectivity with China on the coordinated development of Beijing-Tianjin-Hebei, the Yangtze River Economic Belt and other fields, tap the potential and broaden the scope of cooperation, and strive to achieve mutual benefit and win-win results. Adhering to the concept of inclusive multi-culture and openness to cooperation, the Greater Manchester will remain open to more Chinese companies and students to invest and study.